Originally created due to a complete mental breakdown, the recovered Hank Pym returned to his Yellowjacket persona upon rejoining the Avengers only to find his identity compromised yet again after being replaced with a Skrull duplicate bent on destroying his teammates. Yellowjacket was Hank's fourth identity, created after the Wasp left him - that's why it's got such an insect theme going on. The Minimate does the costume well. He gets a new mask piece with the eyes and mouth area cut out, and antennae molded on the sides. The big silly wingss on his shoulders are here, created as a separate piece that fits over the torso. It's not quite the right size: there's a small gap between the lower edge of the black panel and the top of his golden belt. He has black gloves, and he's painted with a yellow logo and several gray highlights. Spanning more than one thousand worlds, the advanced Kree Empire ruled most of the Galaxy for ages before finding their ultimate enemy in the form of the shape shifting Skrulls. Now evolutionally stagnant and weakend by war, the future of the Kree race rests with their distant cousins the Inhumans. 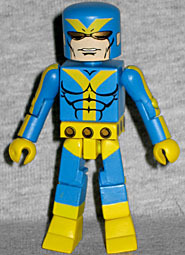 Kree come in two varieties: pink-skinned, like Captain Marvel, and blue-skinned, like this guy. 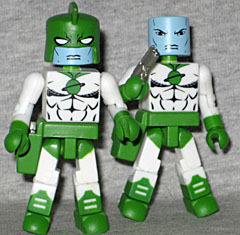 Well, "these guys": Minimates series 32 had a variant, and both versions came a Kree Soldier so you can armybuild. The costume is green and white, with a ringed planet in the center of the chest. The finned mask is removable, but there's no hair to replace it. He has a small silver gun, and a holster to keep it in. Another costumed identity of the brilliant Hank Pym, nothing could stop the former Ant Man and Giant Man from serving as an Avengers. [sic] Though eventually replaced by his Yellowjacket persona, the Goliath name would later by utilized by Hawkeye, Atlas and both Bill and Tom Foster. Hank changed his supranym from Giant-Man to Goliath because reasons. The costume is blue with yellow stripes, rather than the red with blue stripes he wore later. He has a yellow belt with gold cirles all the way around, and the Hulk feet (meant to make him look like he's growing, we guess). The stripes run on the outside of his legs, up the center of the trunk, then split in a Y to hit the shoulders and continue down the arms. His mask has no insectoid influences - just gold lenses. Both Hank and variant Hank have removable masks, and both have hair to replace it. Surprisingly, the hair they're given is different: Yellow Jacket has a short, neatly combed 'do, while Goliath has a shaggier look. Credit for making sure they're both the same color, but Hank Pym has blonde hair, not vaguely orangish. The Yellowjacket persona was created in AVENGERS #59, as a result of Hank's exposure chemicals in his lab. The exposure, coupled with the anxiety from Hank wanting to ask Jan to marry him, led to a nervous breakdown and disassociation with his previous identities. It had nothing to do with Jan leaving him - that didn't happen until two decades later. 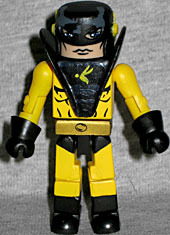 where can i get a mini-mate Yellowjacket?